Karlheinz Essl and Klaus Burger are both musicians with a pedigree on the European experimental music scene. Burger is a renowned tuba player from Germany who also plays didgeridoo and cimbasso (pictured above), a brass instrument which is a cross between a trombone and a tuba. Essl is Austrian and plays guitar, as well as being a skilled sound manipulator and electronic musician. 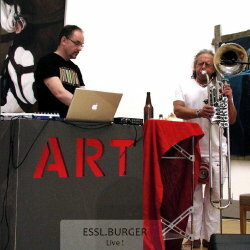 The two occasionally collaborate on live improvisations, and Essl.Burger Live contains pieces from two shows that took place in Austria in 2007. Things don’t start particularly promisingly. The first half of the first track seems to consist mainly of random stabs of brass, didgeridoo drones and clattering, arrhythmic percussion, but as it progresses, it gets increasingly cosmic and atmospheric as the two players seem to find a common wavelength. It ends, frustratingly, just when the two seemed to have found a hypnotic groove – perhaps they sensed they’d taken the piece to a place from where they had nowhere further to go but to repeat themselves. The second piece recorded at the 2007 Artacs festival in St Anton is sinister and brooding, with sporadic episodes of brief violence. It ends in a contemplative calm at odds with what preceded it. Tracks three and four were recorded three months later, and feel both more structured and paradoxically more adventurous. The first is magnificent, with a filmic atmosphere, lonely brass figures, almost choral drones and an effortless sense of space and malevolence. Slow and drawn out, there are moments of loud terror that keep the listener on edge for the whole 15 minutes. It’s an aural horror movie that segues into the mad march of the final track, where the tuba stomps relentlessly like an unstoppable monster, surrounded by electronic screams that resemble the death rattle of its victims (including one who sounds like Sooty’s mate Sweep). Spooky stuff. Fans of Supersilent will love this. Those who aren’t generally keen on improv might find that this isn’t as ‘difficult’ as a lot of music in the genre. It has moments of beauty and moments of madness, but you always get the feeling that Burger and Essl know exactly what they’re doing. Give it a listen – it’s free from the XS Records website.